Compliance executives all know that the department manager is their last, best resource for having co-workers complete past-due compliance training. Before today, this required a different report for each manager and endless emails. Not an easy way to get to 100% completion and not an efficient use of anyone’s time…. 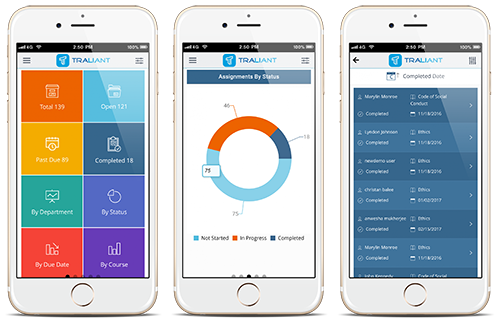 With the release of Traliant’s Compliance Manager app, the days of emailing spreadsheets and asking departmental managers to chase end users is over. With this app all of your managers see only their direct reports and the status of their compliance training. When deadlines approach (or, gasp!, pass) with a few clicks each manager can send a reminder email to just those whose training is past due. The result? More on time completions and less headaches getting those stragglers over the finish line! To see for yourself, fill out the form below and download the app today!